Menstruation affects all women, but it does so differently, ranging from a slight inconvenience to a debilitating experience. Approximately three out of four women experience at least some symptoms of premenstrual syndrome (PMS), and they tend to peak during their late 20s and early 30s. PMS typically occurs in a predictable pattern and is triggered by hormone fluctuations. Most often, it involves mood swings, abdominal bloating, and abrupt fatigue. Fortunately, there are several things you can do to combat fatigue during menstruation. Keep reading to learn more about banishing fatigue during menstruation. Fatigue is defined by the overall feeling of weakness, exhaustion, and decreased energy levels. Fatigue usually occurs when the body has to work harder than usual to carry out everyday activities, but during PMS, it often happens regardless of exertion. Fatigue also causes other bothersome symptoms like difficulty concentrating, irritability, and headaches. These habits can help prevent fatigue and other PMS symptoms. Studies have shown that exercising at least three times a week can increase energy levels by as much as 20%. Exercising regularly also provides other health benefits like reduced stress, improved moods, reduced pain, and more efficient body functions. Cycling, walking, swimming, and yoga are all good low-impact workouts that are easy to incorporate into a daily routine in order to fight fatigue. Eating small, healthy meals and snacks every three to four hours is better than eating three big meals a day. Try to include fiber and protein into your meals because whole grains provide physical energy, and the amino acids in proteins are essential for the body's functions. Try to avoid sodas, sugary juices, coffee, and alcohol during menstruation in order to prevent fatigue. Replace these drinks with water to stay hydrated and alert without the crash. The average adult needs between seven and eight hours of sleep every night. Unwind after dinner by unplugging and avoiding computer and television screens, which stimulate the eyes. Before bed, try reading a book, listening to smoothing music, or taking a bath with calming essential oils, like lavender. 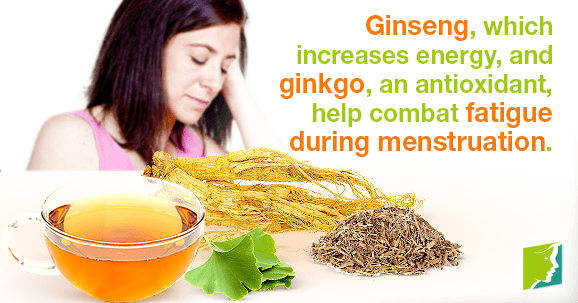 Some energy boosting herbs can be helpful when dealing with fatigue during menstruation. Ginseng has been known to improve concentration and increase energy, working by stimulating the nervous system. Ginkgo is another beneficial herb. It is antioxidant, and helps combat fatigue by supporting blood circulation and enhancing oxygen utilization. Sunlight perks you up and releases serotonin in the brain, which makes you feel good. Eat your lunch outside or go out for a short walk if possible. The fresh air will energize you as well. The hormone fluctuations women experience during menstruation can cause severe fatigue, headaches, cramps, and mood swings. It is important to try and remain active, get plenty of sleep, and eat healthy in order to prevent fatigue during menstruation. Learn how to soothe fatigue and nausea, along with dietary changes that can help.